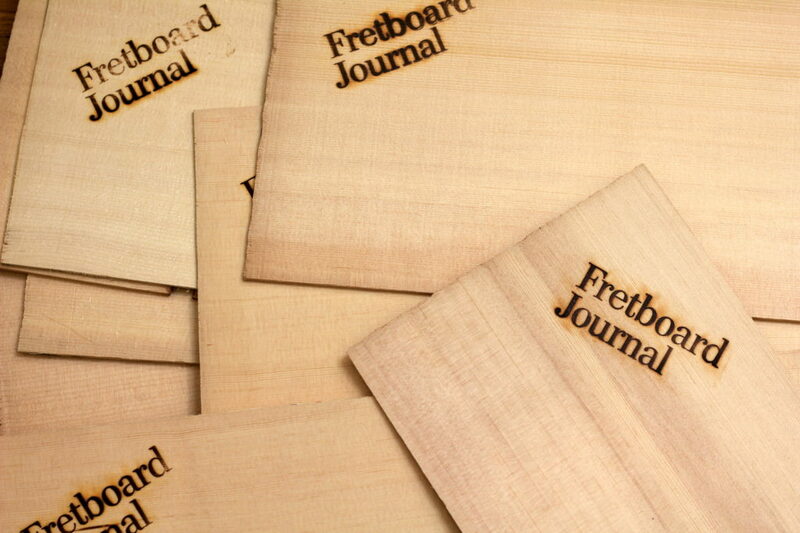 I’ll try to make a long story short: Back at the first Fretboard Summit, we gave out swag bags. Strings, coffee mugs, the usual stuff that guitarists love. But we also had some other items that were, let’s say, a bit more esoteric, like rejected Sitka tops that came from our friends at Pacific Rim Tonewoods. PRT is up in Concrete, Washington and is a rather fascinating story in itself (we actually filmed this doc on founder Steve McMinn). They supply Spruce to makers large and small and are essentially a bespoke sawmill for the guitar industry. Rather than send these fine pieces of lumber to their Duraflame pile (seriously, in an effort to reduce waste they make their own in-house version for wood stoves at PRT), we grabbed a few hundred sets, branded them with our magazine’s logo and thought they’d be the perfect vehicle for collecting autographs at the Summit, assembling a campfire charcuterie plate, perfecting your tap tone face, making s’mores or whatever else one does with a thin plank of spruce. Well, it wasn’t far into the Summit weekend before a young builder, T. Drew Heinonen, started rooting through the stacks of spruce that had yet to be claimed. Heinonen is probably not on your radar… yet. For starters, he’s relatively young. His operation is small, his self-promotion is minimal. But he’s setting up a new shop in Minnesota, he’s built a dozen truly nice guitars as of this writing and he has a long career ahead of him. Some of his instruments harken to classic Martin designs, some are a bit more inspired by the work of Jim Olson, who he happened to apprentice for. When Drew told us he was possibly going to build a guitar out of the Summit wood stash pile, a plan was hatched. We decided to order that guitar, an instrument we’d unveil at the next Summit (October 2016 in San Diego) and feature at our office sessions and future Summits. We’d chronicle its build through our podcasts, an article or two (here we are) and maybe some video. Capture the whole process the way few ever get to. Procure as many pieces as could from our end, in an attempt to tell a bigger story than just the guitar’s. Drew makes a handful of different guitar models, including a dread, an SJ and a parlor but we locked on to the classic OM shape. Our hope was that it would handle the wide variety of players and playing styles that we see every month at our magazine’s offices. Our original idea was to use the Summit swag wood for a top and to find woods that were sustainable and domestic for the back and sides. 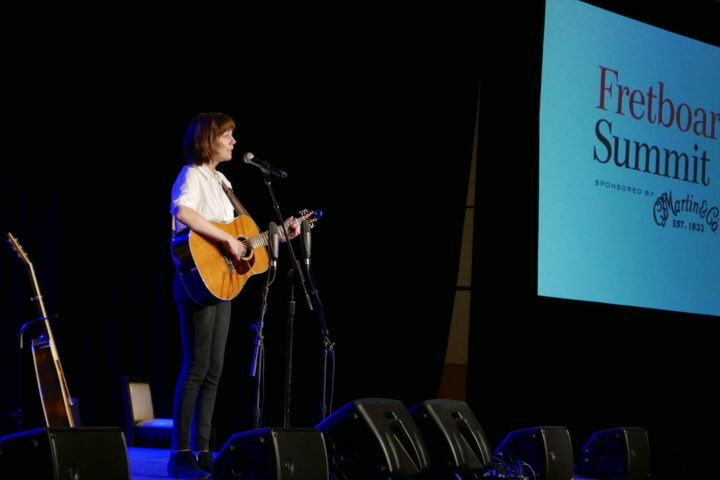 Sustainability was a big theme at the first Summit, with talks from both Pacific Rim, FJ correspondent Peter Howorth and others. But, between the branding job Scott and I did and the fact that a lot of the wood already sported defects, we decided to upgrade. Why get a new custom instrument with a flawed top? My other thought was that, while I didn’t want an ugly guitar (and neither did Drew want his name on one), I could care less about aesthetics. Performance and tone are what really mattered, I’d rather have a sleeper guitar that surprised everyone who strummed it than a blinged out, highly-figured guitar that didn’t deliver. In one of our podcasts, I used the analogy of Paul Newman’s hot rodded Volvo station wagon: It looked like an average soccer mom car but it could fly down the racetrack. I wanted that guitar. So we started to poke around. We went back to Pacific Rim, as they were the catalyst for this whole project. We wanted a couple of defect-free tops to send to Drew. From PRT, we obtained a torrefied Sitka top and a Lutz top. Meanwhile, I’ve been following the Hampton Brothers for a while on both eBay and YouTube (this video of them harvesting Red spruce is a must watch). To give Drew some choices, I decided to buy a Red spruce top from them. Matt and Nathan Hampton explained how they stock both old growth Red spruce and second growth. The “Master Grade” Red spruce top sets could cost as much as $600 but they had a nice AA old growth set that was around $100. We went for that one (below). As for the back and side woods? 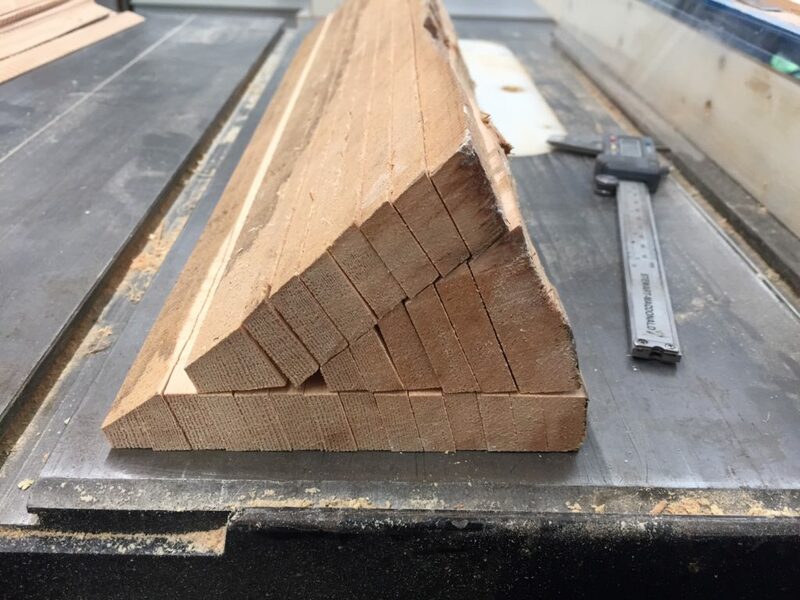 It turns out it’s really easy to go down a sustainable wood rabbit hole. No, we are not the first guitar nuts on a quest for a domestic alternative to Brazilian rosewood, nor will we be the last. 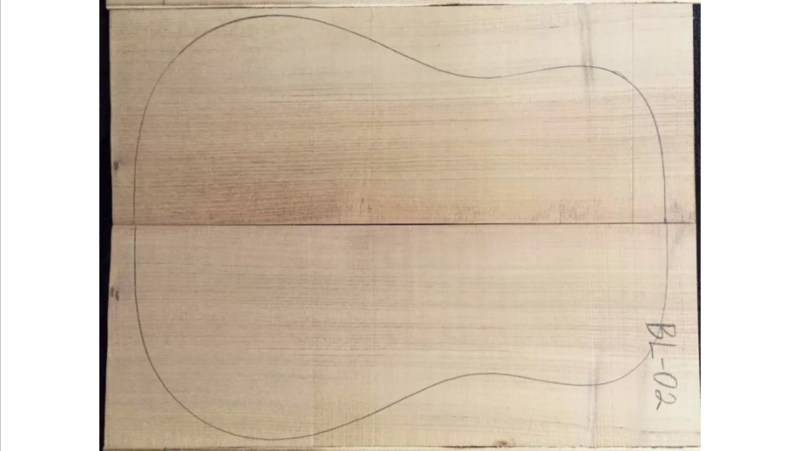 A few minutes of browsing the Acoustic Guitar Forum will have you discovering and googling woods such as Osage orange, Black locust, walnut, kiawe and plenty of other alternatives. Tim McKnight is one of a few builders who has used many of these woods and talked about his experiences, his thoughts on these woods were definitely noted. 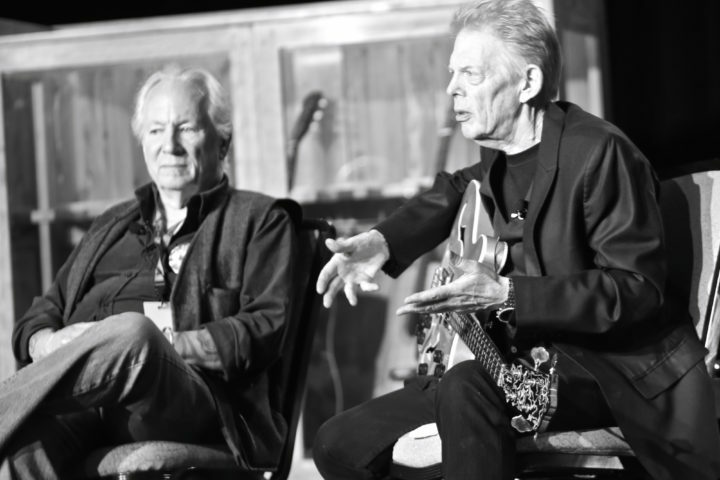 Unfortunately, when it comes to shopping for this stuff, it’s feast or famine – you never really know how long the wood has aged or how it’s going to sound when you get it. Sometimes you can’t even find these woods for sale. We had an entire talk at the first Fretboard Summit on kiawe, the non-native relative of mesquite that grows in Hawaii. We also have a feature on its merits coming up in our magazine. 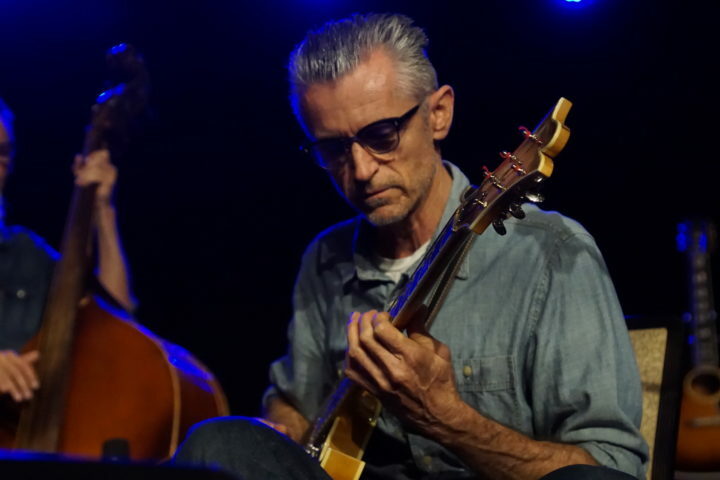 It’s basically firewood for the locals, but at least a few luthiers and players have noted that it can make for a very Brazilian-esque guitar (tonally, that is… visually it doesn’t look like much). At the end of the day, we simply couldn’t find a set big enough for a guitar during our search period. A lot of kiawe wooden bowl blanks on eBay, but those wouldn’t cut it. I was happy to discover during my Red spruce order to the Hampton Brothers that they also stocked a ton of domestic back and side woods. So, while placing our order, I nabbed some Black locust and walnut from them. As you can see, Black locust (below, top) isn’t so black. It almost looks like a top wood. The walnut (below, bottom) had a lot of figure. These were sent directly to Drew so I never got to fondle them. 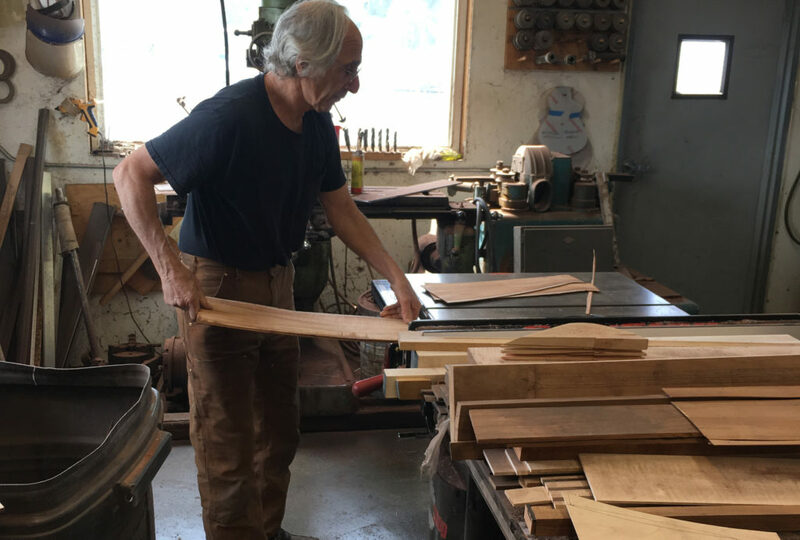 Since I was about to send Drew his first care package with our spruce, I figured I’d stop by Gurian Instruments’ headquarters and see what I could order from Michael Gurian. I knew we’d eventually need some purfling and binding and, who knows, maybe Michael had a secret stash of woods he’s been hoarding in the bowels of his ship? Gurian’s floating factory is just about a mile away from the FJ and I consider him an extended part of our family. Gurian gave us the nickel tour of the barge and we started rooting through piles of wood he has onboard. As we trailed Michael, questions were flying: Who is this guy building the guitar? What kind of neck joint does he use? What kind of saws does he have? 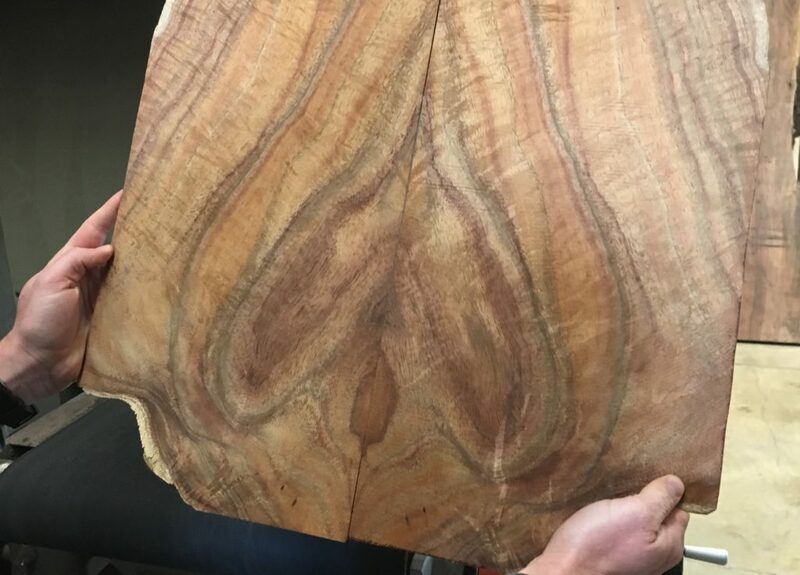 Want some cocobolo? I tried to explain our sustainable / domestic concept to Gurian; he seemed skeptical but I expect nothing less than complete honesty from Michael. 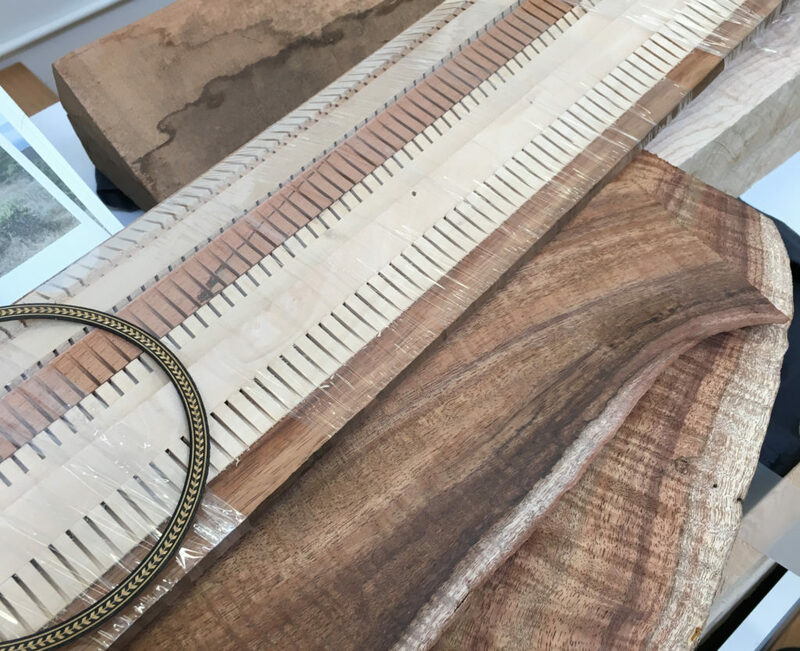 Ultimately, he found us some maple blanks for the neck, some kerfing options, some binding options and a giant hunk of lightweight Sitka for the braces. He then stumbled upon this rather wildly figured piece of koa. We took our growing wood pile (below) and sent it to Drew via UPS. We then had to make some hard decisions on what materials would actually go into this thing. Our Facebook followers were less than kind to photos of the koa (its pattern seemingly reminded people of all sorts of body parts), we hemmed and hawed and then we deferred to Drew for advice, who is the real expert here and the only person who has tapped and studied all of these woods. This all put the Black lucust in the lead. He then put a template on the koa to show us what its final layout would look like. I know it’s not perfect but it was starting to look a bit more promising. On Podcast 109, after a ton of back and forth, we locked in on our woods (spoiler alert: It wasn’t easy but we choose the combination of koa / lutz). I’m still torn about this decision and I sincerely hope that Drew makes a guitar out of the Black locust and Red spruce combination just so we can one day do a comparison. 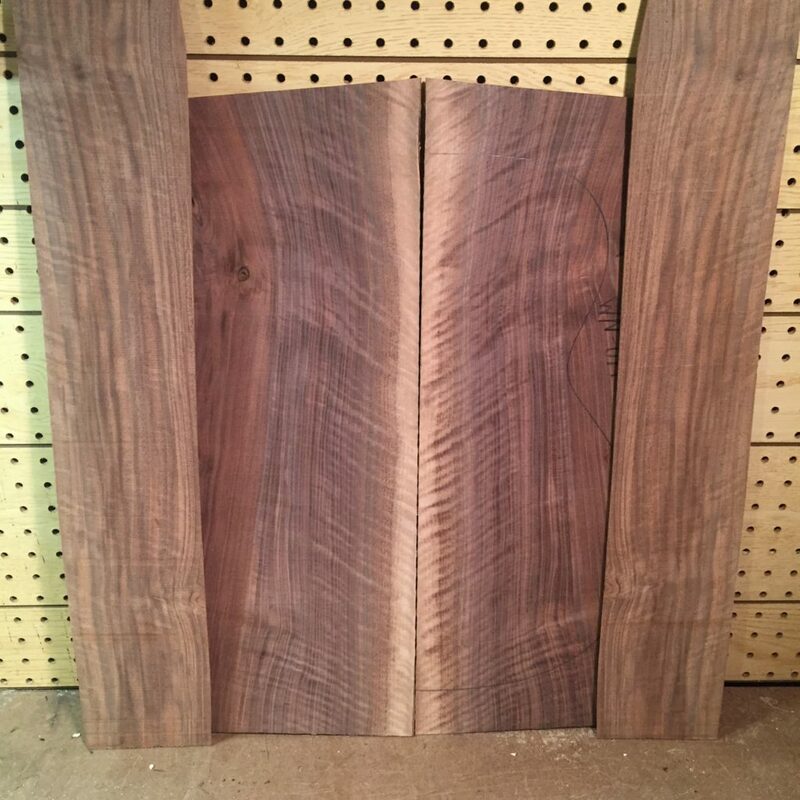 I know it’ll be amazing and some customer will be very happy with those woods but, for this project, I wanted to see how good Drew could make that funky koa sound. I should note that the July 2016 news of Michael Gurian retiring and looking for someone to buy his business by the end of the year adds a little weight to this guitar. Sure, it’s just some piece of koa from Hawaii that just happened to be on his barge during our visit but it still came from a person who is pretty special to the guitar community. I’m glad we chose it. As of this writing, Drew is hard at work on the guitar. The chunk of Sitka that Gurian gave us for bracing was perfect, light and resonant. Here’s what it looked like after Drew started spliting it. We still have plenty to do (I use the royal “we” even though Drew is doing all of the work), including assembling the body, figuring out our fingerboard wood, ornamentation (if any), getting a case and other odds and ends. At some point, we’ll be placing an order with Stew-Mac for Waverly tuners and other parts but I’ll wait till I get the signal from Drew. In the meantime, we’re excited to one day play this thing. We’ll be checking in with Drew every couple of weeks and documenting the entire build process via this page, the Fretboard Journal podcasts and our Facebook page. Check them out if you like or subscribe to all of our podcasts (there are 110 and counting) for free via iTunes. 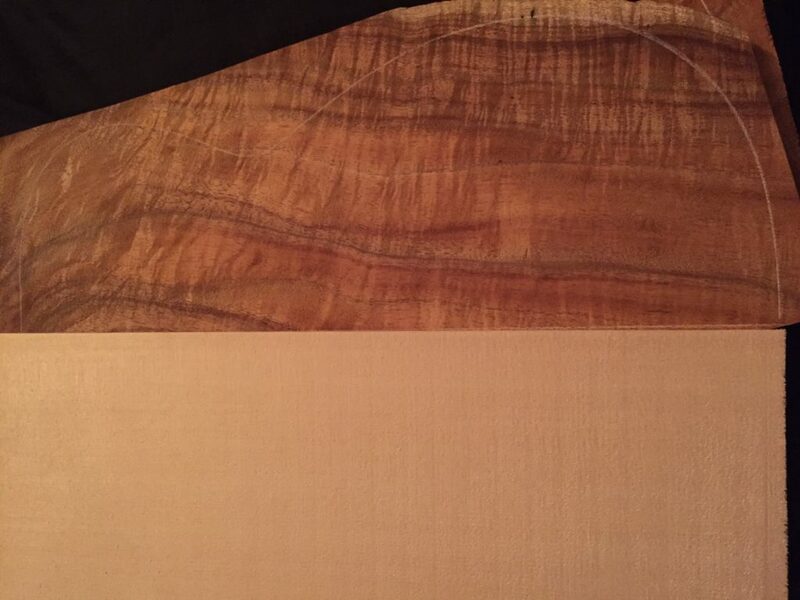 Come October, we’ll be unveiling this guitar at the Fretboard Summit. It’ll also be here in Seattle for any of our readers to check out. Editor’s note: Ordering a custom instrument is an intoxicating experience. Most every builder of note (Drew included) have a great stash of wood that they know intimately. Trust your builder and go with what she/he knows. They probably have some amazing woods on-hand (or that they can source) that they know well. This is all a grand experiment and a chance for us to trace our guitar’s roots and have a little fun.